My beautiful mom who is from South Korea is a proverbial woman to say the least. In her Korean accent I have heard her say many times, "You never think you too good to pick up penny. To pick up penny, you must scoop down low to pick up. Not many see value ~ but you must. For it is like what God did when no one else saw value in us, He scoop down low in form of man who is Jesus and pick us up." Understanding the significance of what I share next gives me great joy. For my mom, who, as she would say, enjoys her 'bling-bling', had a teachable moment one day a few years ago when she spotted a penny in the parking lot. In a moment, as she was about to bend down to pick it up, she was hesitant to do so, as she had a quick thought, "What might others think?" But that thought immediately left her when she was reminded, "You think you arrive?" And her answer being, "No", she came back to herself and with excitement picked up the penny and said, "O, this is 'God kiss' to me." From that time on, after she picks up a penny, she says a prayer for dad and herself and us, her daughters. I have known the story as she told me quite often of what the penny meant to her. So last week, I received a phone call as my mom was so happy. In her accent she exuberantly said, "Treesa (this is how she says my name), I got God kiss. We come back from out of town and see shiny, new penny on door mat. I saw it, but didn't think. Dad saw it and he walked over it and then I remember, penny! So, I thought Mary Kay, your sister left on porch. I call her and ask and she said, "No Mom. It's from Jesus." "O Treesa, penny from Jesus! There was no penny when we left and now penny here. It's from Jesus. O thank You Jesus." Of course, my mom is adorable and I was happy for her, but yet the significance of her experience trumped my lack of understanding in her excitement as she shared her story with me. Now let me take you to another part of my day yesterday. So, I went to a friend's house who was suffering from a migraine. She had text me in the morning to pray for her and she was going to rest where it was dark. I text her back and told her I would pray. As I began to pray, nothing specific was being declared over her. Immediately I asked, "God, what is going on?" In that moment I felt impressed to go to her house and pray over her. After taking my daughter to school, I went to her house just two blocks away. I was parked in her driveway and text her the following message, "I am at your house, if you are up, I would like to pray over you." Within seconds, as I approached the door, she opened the door and let me in. I asked the Lord to anoint my hands with Who He is as He is Healer and said, "Lord, I know it is not my hands or my prayer but YOU who heals." I knew healing was taking place over her body after I was led to massage her upper shoulders and her head. I then asked, "Is the headache gone?" And she said with a smile and a sigh of relief, "I can barely feel that I ever had a headache." So after this beautiful moment, we fellowshipped for a while longer and then she said to me, "Teresa, after reading part of your book, I was reminded of another book and was led to this particular page, I made a copy of it for you. She read it to me and then gave me the piece of paper and the title of the message was, "My Princess...You are my Masterpiece." After leaving her home, I had the opportunity to visit with another friend to help pick out a paint color before they moved in. On my way to her house, I had an imprint of a beautiful lady's face pressed into my thoughts.who I knew (Whenever that happens, I know I am suppose to pray). I believed in that moment I needed to call her and so I did. She did not answer which allowed me to leave her a voicemail message. Fast forwarding to the end of the night, I was taking our garbage can out to the front. Now very rarely do I ever go through the front entrance, so as I was bringing the garbage out, my eyes were drawn to look to the ground and BAM, there was none other than a PENNY! I was like a little girl, here I was outside in front of my house, jumping up and down in my pajamas. I proclaimed with excitement, thinking of my mom and shouted, "A God kiss!" 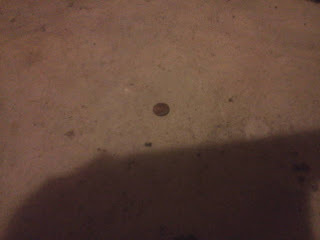 With silly excitement, I picked up the penny, and then quickly put it back down so I could take a photograph of it. I ran inside the house, grabbed my camera device, running back outside, hunched over the penny as the porch light was overhead. Even before this point, I didn't care what I looked like. I was capturing a very significant moment. BUT, the story doesn't stop there! Are you ready for more? Now leading to this morning. Every morning, one of my dear girls, a young woman sends out a voice memo reading a daily devotional, Jesus Calling written by Sarah Young. Before reading the devotional she said how she heard, "Masterpiece" and received confirmation from the radio and then the devotional she was about to read and was led to Ephesians 2. As I am listening to her voice memo, I was incredibly moved and thought, "Wow! This is amazing." Especially with the piece of paper that was handed over to me yesterday from my friend while at her house. To this very moment as I was catching up on some emails, suddenly my phone rang. It was the woman whose face was imprinted into my thoughts the day before; remember? She is the one I left a voicemail for. She said, "Teresa, you couldn't have called me at a better time." She proceeded to tell me how she was having a difficult time with getting things in place like she needed to. She said, "I need something. I just don't know what it is." Suddenly, and yet again, imprinted in my thought was the penny. I thought, "Really, Lord? You want me to tell her that silly story?" And then continued to say, "Can I tell you a story?" As I told her the story of the significance of the penny and what my mom has taught me about God scooping down low to pick us up and then sharing what happened last night as I found a penny on my front porch, she said, "This is freaking me out! I have to tell you what happened yesterday." "I was driving around as I was collecting my thoughts. Yesterday was the third anniversary of my best friend's death from suicide. We went over to his house where he use to live as we were going to clean it out when I realized my mother-in-law had already completed the task. Before leaving the house, I went into the garage where he had been found and when I looked down, there was a penny. With tears she said, "I felt like it was a sign from him." I said, "May I ask you a question?" I asked, "Out of all the stories I could have told you, God led me to tell you this one. Do you know Jesus Christ as your Personal, Rescuing Savior?" And she said, "I know I need to go back to church." And I said, "I want you to know that it isn't about 'going to church'. It is about having a relationship with God through Jesus Who is the only One who has the power over death and resurrected from the grave." Are you ready?????? Haahaa!!!! Praise God! Ahhhhhhhhhhhhhhhhhhhhhh!!!!! I can't contain myself...for within moments, God received the increase as she received her Rescuing Savior Jesus Christ as we were able to pray with one another. I am still in awe that I got to be a part of His Master plan in her life, as she is His masterpiece. As we closed our conversation over the phone, I asked the Lord,"Will you please give me something she can hold onto?" 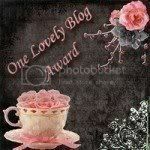 Then, I remembered 'masterpiece' and said, "I have something for you from Ephesians 2:10." I was then led to speak it over her to make it personal just for her, "(Her name), you are God's masterpiece. He has created you new in Christ Jesus, so that you can do the good things He planned for you long ago." "We are a masterpiece and have a master plan from the One who scooped down low to pick us up." Oh, Treesa! I l-o-v-e this! How precious is God's timing and care for all of us?! I'm so glad I got to read this. So special. Bless you! Goosebumps all over me right now! God is involved in every single detail of our lives no matter how big or small. Teresa, I keep finding pennies in places that you'd never expect a penny to pop up! ;) Until today, I thought of them as insignificant...but no longer. I know they are there now as reminders! I love the way God weaves things together for His purpose! This story was another amazing testimony to His power in every aspect of our lives! I'm celebrating with you that your sweet friend accepted Jesus that day! Pennies from Heaven....oh yes!! !